The world is currently experiencing its greatest moment of political upheaval since the 1980s. The presidency of Donald Trump is normalising authoritarianism and white supremacy in the United States to an alarming extent. Worse still, ideological fascists are on the rise across Europe. This year, Marine Le Pen of France’s extreme nationalist party, Front National, received double the number of votes her father managed at the party’s high point in 2002. Austria is now ruled by a coalition between hardline conservatives and the far-right. Most chillingly of all, given historical events within living memory, Alternative für Deutschland, a neo-Nazi party, is now the third largest faction in the German parliament. Fortunately, the polar opposite of fascist politics is resurgent too, growing in a way we have not seen in the developed world for decades. Socialists agitating for a confrontation with “the greed and reckless behaviour of the billionaire class”, and a world that works “for the many, not the few”, are also on the rise. They are campaigning to expand worker’s rights, the welfare state, and environmental protections, while fighting racism and authoritarianism. From Britain’s socialist Labour Party leader Jeremy Corbyn to American left-wing presidential candidate Bernie Sanders; from France’s left populist Jean-Luc Mélenchon to Spain’s anti-austerity movement Podemos to Greece’s governing party SYRIZA, class politics and socialist reforms are fast becoming mainstream and popular again. A bold message of hope and genuine change is charging back onto the field of political contention. Britain’s Jeremy Corbyn, Spain’s Pablo Iglesias, France’s Jean-Luc Mélenchon and America’s Bernie Sanders: the generation of leftists bringing socialism back into fashion. Calm Waters Surrounded by Titanic Storms? On the other hand, New Zealand’s recent general election produced a result that will leave society and politics almost entirely unchanged. This fact is confusing given the context of international events. 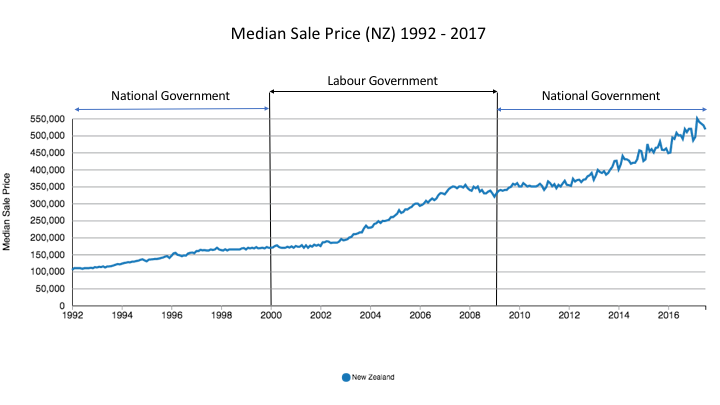 The National Party’s level of support remained astoundingly high for a party in an MMP system, particularly given their nine years of office, and the fact that they had presided over and made worse an economic paradigm that works against the interests of the majority of the people. Winston Peters may be an anti-immigration populist, but he is tame and mostly harmless compared to Donald Trump, let alone the fascist insurgents in Europe. He is not unfamiliar to our political scene; he has dominated the headlines in New Zealand media for decades. New Zealand First did not receive a large share of the vote, and the party has been in governments before—held them to ransom before, even—without very much effect. His role in the new government is not demonstrative of New Zealand succumbing to international upheaval. The social context of the election is that inequality, especially its most severe consequences in child poverty and homelessness, is at utterly unacceptable heights. The housing crisis, precarious and low paid employment, underfunded public services, and a shockingly skimpy welfare system are making life worse for so many working class people in Aotearoa. Mental health problems are worsening and suicide rates are escalating. Our environment is being polluted in ways that may be beyond repair, with our rivers poisoned and our seas drilled for oil, while New Zealand’s net greenhouse emissions continue to increase. These social and ecological crises are not just the result of National’s nine years in government—though National did make them worse. These crises are features of the economic system we live under, and typical of international trends over the last 30-40 years of worsening inequality and environmental destruction—trends largely unaffected by whichever political party holds power. In New Zealand, these problems have been exacerbated by the policies pursued by every government in the last 33 years—they are not nine years old. Aotearoa’s inequality crisis is decades old—every government since 1984 is complicit. Image credit: Inequality: A New Zealand Conversation. Do not believe for a second their rhetoric: the Labour government is committed to managing our current system as conservatively and unimaginatively as possible, and as a result we will see little to none of the change we so desperately need. Those who have a vested interest in the status quo will celebrate the conservatism of the new government, overjoyed that they are not being confronted with political anger in ways their overseas counterparts are currently facing. And yet they are fools if they believe that this rigged economic system can last forever. If they do not believe that unrest will arrive on our shores, and sooner rather than later, they are sorely mistaken. It will happen here, whether any of us like it or not. The consequences of the storm we will surely experience shall be decided by whether a vision of hope or hatred can prevail. Those of us who wish to see a better world must be ready to fight as hard as we can. To understand what is happening around the world, why it will happen here, what is at stake, and what vision we must advocate, we must first explore the most recent era of world history: the neoliberal era. In 1992, political scientist Francis Fukuyama published ‘The End of History and the Last Man’. The book argued that, with the advent of neoliberalism and the fall of the USSR, free market capitalism had finally triumphed over all other economic systems, and that humanity’s social evolution was at an end. Fukuyama’s case was that the Washington Consensus of free trade and free markets was the final stage of history, and that future politics would simply revolve around the expansion of and minor adjustments to this political settlement. Until 2008, it seemed that Fukuyama might just be right. strong trade unions which were able to campaign in the workplace for better wages and conditions, and in the political sphere for the continuation and expansion of worker-friendly policies. heavy restrictions on the ability of unions to organise, campaign and strike, and the hijacking and undermining of social democracy, both in its role as an ideology popular among the working class, and as, in most capitalist countries, one of the two major parties able to consistently contest and win elections. This assault on the institutions and power of the working class was arguably the most thorough and successful class war in history. Breaking the trade unions was the most important pillar of the neoliberal project. Image credit: New Zealand Council of Trade Unions. Many attempts have been made to explore the intentions of the neoliberals. Reagan and Thatcher have been presented as moralistic true believers, who saw the government as inherently totalitarian, counterposed with capitalism, which they viewed as the ultimate expression of freedom. They are attributed noble intentions as champions of their individualistic worldview. Thatcher went as far as to claim that “there is no such thing as society”. Their stated aims were to destroy socialist principles of collective struggle and provision, and to create the conditions for high economic growth, and therefore greater prosperity for everybody. Neoliberals may or may not actually believe the narrative they espouse—it doesn’t really matter. Whatever these people believe, their stated aims are proven to be either incorrect or flatly disingenuous by the actual results. Neoliberal policies have, in practise, dramatically increased the wealth of the privileged few in society at the expense of the vast majority of people. Everywhere neoliberalism has been tried, it has been unsuccessful in boosting economic growth—as even the International Monetary Fund admits—and in growing the living standards of working class people. It has not improved society by any measure that matters in people’s lives. Neoliberalism has not smashed the state, but rather used the state as a tool for redistributing wealth upwards; it has not ended collective struggle, but instead acted to advance the collective interests of elites rather than the interests of the working class. The only success of neoliberalism has been to further stratify society; inequality has increased in every country that has taken this route. As a result, we have seen increasing poverty for the working class, while the capitalists have thrived. A better explanation is needed for why neoliberalism has spread across the world so successfully. David Harvey argues in ‘A Brief History of Neoliberalism’ that rather than being a utopian ideology of the supremacy of the market, neoliberalism is a class project by economic elites to restore and enhance their power. Harvey demonstrates that in every instance where the supposed principles of market supremacy have come into conflict with the interests of the capitalist class, the latter have always prevailed. As Harvey states, you can infer intent from probable outcomes. Tax cuts for the rich alongside attacks on public spending and the unions are highly likely to redistribute wealth from working class people to the owners of capital. Therefore, upwards wealth redistribution must have been the aim of the neoliberal project. The rise in inequality is not local to Aotearoa, it is global—it is the product of a class project by the international economic elite. The public posturing of neoliberals, with their protestations about the market, freedom and “personal responsibility”, need to be seen for what they are: a thin veil for an endeavour by the top 1% to increase their own wealth and power. However, it is vital that we pay attention to the effects of market fundamentalism on democracy. Here, Will Davies’ definition of neoliberalism is the most accurate: “the disenchantment of politics by economics”. He is arguing that the neoliberals seek to depoliticise the very political process itself, to reduce democratic debate to nothing but political parties campaigning on marginally different ways of managing neoliberal capitalism. Politics is about collective decision making. Already, we encounter a problem for neoliberals; collective decision making goes against both the ideology of individualism, and against a policy agenda which benefits only a wealthy minority. This is why since the birth of neoliberal ideology, its principal role has been, by necessity, to try to pretend that its ideas are not an ideology at all, but in fact that capitalism is the only way society can possibly be run. Another of Thatcher’s common refrains was “there is no alternative!” Neoliberalism can only ever succeed if people believe there is no other conceivable way to run society. To succeed, neoliberals must depoliticise everything and everybody, remove all silly ideas about solidarity and the collective strength of a united class from the consciousness of society, and fundamentally stop democracy in its tracks. Recent international events represent the return of democracy—a prospect that can only spell trouble for neoliberalism. Social Democracy: An Impossible Dream? If neoliberalism relies on tricking the majority of people into participating in a system rigged against their own interests, how on earth did it succeed in disenchanting politics? The neoliberals had to destroy all opposition to their ideas and to their power, by convincing the opposition to vote for leaders who agree, on either an ideological or a practical basis, with neoliberal ideology—leaders who themselves believe deeply that there is no alternative. Neoliberalism cannot succeed without subsuming social democratic parties in their entirety. Conversely, the left cannot succeed without breaking fully and absolutely with neoliberal leaders of social democratic parties. The Third Way is the tendency in centre-left politics to which the leaderships of nearly every social democratic party in the world subscribed from the 1990s until very recently. Social democracy’s leaders, who once would have campaigned for the welfare state and represented the interests of the trade unions, now accepted that with the End of History had dawned the end of their political tradition, and that they should embrace neoliberalism themselves. Third Way means social democracy accepting low government spending and a politically powerless working class. Third Way politicians are often called ‘Blairites’ after Tony Blair, British Prime Minister from 1997 to 2007. In an interview with Rupert Murdoch’s UK-based tabloid, the Sun, weeks before winning the 1997 general election, Blair reassured Sun readers that once Labour took power the UK would “still have the most restrictive union laws in the Western world.” Blair defended this statement in the Guardian: “People on the Left have got to understand the realities of the economic world. You will do more to prevent people being treated as commodities by giving them the best educational skills and opportunities, and by having an employment service that is dynamic, than you will by trying to protect the workforce with over-restrictive union legislation. Again, we are under massive attack from the Conservatives in relation to the things we are offering.” His response touches on another crucial point—that neoliberals in conservative parties must pretend that not only do Blairites represent the most change society can ever hope for, but that the ideas Third Way politicians represent are dangerous, radical, economically damaging, and a threat to the people. They must do this not only to preserve the illusion that there is no alternative, but to justify the mere fact that Third Way and conservative politicians operate within separate parties! Pivotal figures who helped cement neoliberalism around the world: economist Milton Friedman, Margaret Thatcher, Ronald Reagan, Tony Blair, and David Cameron. Elections in the neoliberal era are no more than contests of personalities. That is a major reason why we have seen the archetypal politician in the last few decades change from the image of an elderly statesman to being young, charismatic, and attractive. Politics? Who cares? Our leaders have become smiling, slick and polished for a very good reason: to hide from sight what is missing. Trudeau, Macron, Blair, Cameron, Clinton, Obama, Turnbull, Key: they all seem so similar because they are. They all represent the same style-over-substance approach, and exemplify the same neoliberal conceptions about the world. Hillary Clinton’s recent book ‘What Happened?’ describes how she managed to lose an election to Donald Trump. She used the book to blame everything but her utterly uninspiring campaign for this loss, particularly targeting Bernie Sanders. In the book, she quotes a Facebook post which she believes demonstrates the dynamic in which she and Sanders were caught in their primary contest. Headline: Hillary Refuses To Give Every American a Pony. Bernie Sanders vs. Hillary Clinton: a primary which polarised the Democratic Party. Image credit: Daily Dot. In reality, all Clinton’s witty post demonstrates is the mentality of Third Way politicians. They believe that a society run, even slightly, in the interests of the majority of people, is laughably unrealistic. Being challenged by socialists proposing mild reforms confuses them to the point of incredulity. They believe so strongly that there is no alternative that they mock the millions of people crying out for one. Perhaps that is how she managed to lose to Trump. History has a funny way of making fools out of arrogant intellectuals who try to proclaim its end. The War on Terror saw the Washington Consensus begin to fracture and fragment; all was not well in Fukuyama’s paradise. When the 2008 Global Financial Crisis hit, the hegemony of neoliberalism was ended overnight. The crisis flipped every claim of neoliberalism on its head. What was supposed to be the perfect economic system, bound to perpetually grow and create great prosperity for all, immune to boom and bust cycles, had produced the greatest crisis capitalism had seen since the Great Depression 80 years earlier. After that, it was only a matter of time before the clash of different ideas about how to run society started returning to the world; it became a race to see who could re-enchant politics with their ideas first. The Global Financial Crisis caused the worst recession since the 1930s, and even the recovery resulted in the rich getting richer and the poor getting poorer. No wonder working class people are so angry. Image credit: Pavlina Tcherneva/Levy Economics Institute. For the working class, 30 years of stagnating wages, jobs heading offshore, increasingly dilapidated and inadequate public services and infrastructure, skyrocketing house prices, increased indebtedness just to survive, and a lost sense of social cohesion, was more than enough, even before the Financial Crisis. The giant tax cuts for the rich were revealed for what they were: a simple act of class war. To add insult to injury, the debt that governments had accrued when they bailed out the banks was passed on to taxpayers in the form of even harsher austerity measures. This explains why people are so profoundly angry that they are willing to vote for anybody who offers a different approach. Working class people no longer believe that there is no alternative; they want an alternative, no matter what. Unfortunately, the far-right got a head start. Paul Mason gave a speech at the 2017 Socialists Together conference, a meeting of social democratic leaders from across Europe. He quoted Will Davies’ assessment of neoliberalism, adding: “The far-right and the nationalists have re-enchanted politics through nationalism, race, and violent misogyny.” The void filled by the depoliticisation of society is fast being filled by this terrifying politics, which can only lead to the fascism, racism, totalitarianism and world war of the 1940s. “Crowds started to be real, they started to be spontaneous.” Image credit: Oli Scarff/AFP/Getty Images. In 2014, when I was 16 years old, I paid attention to the New Zealand general election properly for the first time. When John Key won, I shared the emotions of every other supporter of the left in the country: depression. National had won and Labour had lost. I struggled to write this follow-up to my original essay for three months, because I was trying desperately to work out how I could communicate my reasoning and emotions to those same people who groaned with me in 2014—those who now celebrate ecstatically the election of a ‘progressive’ government—without alienating anybody who might read my work. The thousands of words of extensive exposition leading up to the conclusions I am about to draw are my best attempt to communicate my reasons for this rational and emotional disconnect. For the last year, I have been saying that Jacinda Ardern is the biggest threat to the New Zealand left—to any of us who want real change. I ask you now, please, don’t celebrate. Prepare to fight! This new government is a Third Way coup de grâce. They are as committed to managing neoliberalism as every other government we have had in the last 33 years. Ardern represents everything we oppose. She has moved any chance of systemic change down the agenda, possibly for years, and we do not have that much time to waste. New Prime Minister Jacinda Ardern with her Finance Minister Grant Robertson. Image credit: Marty Melville/AFP/Getty Images. Ardern represents a stunning victory for style-over-substance political culture. Those who view Ardern in a more positive light than Andrew Little, ask yourselves: why? Because she is more charismatic and therefore more electable? All that demonstrates is that the new government’s mandate is built on sand. If the centre-left is going to succeed or fail based on the popularity of its leaders, then as soon as a more charismatic National Party leader comes along, all Labour’s policies will be reversed. Were we not right to despise the fact that John Key was popular for no reason other than his (inexplicable) personal appeal? What Key represented could happen again; we have no choice but to reject personality politics and instead offer a substantive vision for society. Many in the media are celebrating this bright new era, and the great change it will bring, just as they celebrated Blair, Clinton, Macron. The corporate media exist to perpetuate the interests of the establishment; they cannot believe their luck that Labour are in power while tied to steadfast commitments against systemic change. There is nothing more terrifying to the media than a genuine left-wing politician. A study of the UK media’s attitude towards Jeremy Corbyn demonstrates that 75% of coverage in his first two months as Labour leader (usually the honeymoon period) was negative. Meanwhile, during the US primaries, Trump received twenty-three times more coverage than Sanders, despite the fact that Sanders was consistently far ahead of Trump in head-to-head polling. If the corporate media are celebrating, that is because neoliberalism has won the day! Media coverage of Jeremy Corbyn: how the establishment treats threats to its wealth and power. The fact that Ardern has not been treated in this way demonstrates that the establishment are not scared of the new government. Image credit: Media Reform Coalition. The Ardern government is embarking on an unambitious political project which amounts to tiny increases to social spending in a broader context of continued austerity and privatisation, alongside xenophobia, and a punitive response to climate change. It is a Third Way project which buys into every neoliberal narrative about society—and will end up entrenching neoliberalism in a way that National could never get away with. For the same reasons, under Helen Clark’s Third Way government, the bottom 10% of New Zealanders got poorer, while house prices doubled and emissions rose. Third Way politics destroy any hope of even the most modest attempt to run the economy in the interests of the majority. The Budget Responsibility Rules, a set of goals for the new government’s budgeting process which include running surpluses, reducing debt, and limiting new government spending, serve the role of solidifying the neoliberal narrative. The most significant of these rules states that Labour will not spend more than an arbitrary target of 30% of GDP, meaning that small government is a permanent fixture of New Zealand’s economy which not just National, but Labour as well, are committed to. So committed is new Finance Minister Grant Robertson to this austerity framework, that he has already announced that there may have to be spending cuts in order to make room for the small increases in spending in health and education that the government intends to make. Buying into the idea that governments can either pursue this spending programme or that programme, but not both, because it would be too expensive, is just an excuse for Robertson to reassure the capitalist class that the government will not even dream of breaking with neoliberal orthodoxy and, say, raise taxes on the rich to increase spending and deal with our social, economic and environmental crises. But it gets worse. Robertson has also signalled that the government is prepared to pursue public-private partnerships in order to meet its social targets. This is privatisation by stealth. Public-private partnerships have long been used to partially privatise state assets, and to bankrupt areas of the public service so that neoliberal governments, whether Third Way or conservative, have an excuse to sell them off. Ardern demonstrated how eager she was to shy away from even the most modest of tax rises on the rich when she ruled out raising the top tax rate near the beginning of her short election campaign. Ardern and Robertson could not be clearer if they tried: they believe, as Blair, Clinton and Clark did before them, that there is no alternative to a neoliberal approach. Meanwhile, if you are wondering how the National Party are trying to differentiate themselves from a neoliberal Labour government, how they are trying to not only make Third Way politics look separate from conservative politics, but portray this Blairite administration as dangerous and radical, look no further than the brave champion of the people, David Bennett. In his speech decrying the evils of Ardern’s programme, he used the word “socialism” 26 times. Comrade Bennett, as a socialist myself, how I wish this government was giving us even the most moderate social democratic reforms! Another example of this government’s neoliberalism is the Auckland regional fuel tax. It is a punitive response to climate change. Rather than taxing large corporations, or stopping new mining, fracking and oil drilling projects, the government is going to tax working class Aucklanders to pay for a transition away from fossil fuels. This is one of the great concerns of the climate justice movement, a concern championed by the trade unions’ Just Transition campaign—that neoliberal politicians will act to save us from climate change, but will pass the cost onto working class people rather than the wealthy in the process. It is a climate policy for the few. Workers are right to oppose the fuel tax, and the left of the environmentalist movement, and of the Green Party, should stand with trade unions in demanding a Just Transition away from fossil fuels. “System change not climate change”, the demand of the union-led Just Transition movement, is not being lived up to by the government’s climate policies, which push the costs of pollution onto the poor instead of the rich. Image credit: Sentro. Finally, the government’s immigration policies are simply unacceptable. The goal of cutting net migration by 20,000-30,000 is scapegoating migrants of colour for our social problems. Make no mistake—when people hear “migrants,” they think “people of colour”. I know I do, and I moved here from England when I was four. This puts people of colour in danger. By inferring that migrants are to blame for low wages and the strain on housing and public infrastructure, and then pursuing policies that supposedly deal with these problems by stopping people coming to Aotearoa, the government gives license to xenophobes to spread anti-migrant hate. After Britain voted to leave the European Union, a vote seen as a protest against high levels of immigration, hate crimes against minorities surged by 29%, the highest increase on record. The same xenophobia could take root here. The left must be loud and clear. Migrants are not to blame for our problems, capitalism is. Low wages, a housing crisis, strained public services? These are the direct result of the implementation of neoliberal policy, and of the greed of bosses and landlords. Austerity has undermined our living standards. Shifting the blame for falling living standards from the rich to people of colour not only puts ethnic minorities in serious danger, it allows the wealthy and their allies in government and the media to get away with what they have done! We must oppose the government’s xenophobic immigration policies, and say loudly and clearly, as Corbyn and Sanders have consistently done: do not give in to racism, do not blame some of the most targeted and vulnerable people in society for our problems. Blame the greed and reckless behaviour of the capitalist class, and strive to build a society that works for everybody, regardless of ethnicity, migration status, and all other factors. It is not the National Party that stops any chance of real change in Aotearoa. It is both National and Labour—as well as New Zealand First, ACT and elements within the Greens, for that matter. There is no question that if we want to change society, we have to first dismantle these organs of capitalist politics and build an alternative for the many, not the few. We have to destroy the Third Way narrative, and to do so we have to oppose Jacinda Ardern and the Labour Party. So, to misappropriate Tony Blair’s attack on Corbyn: “let me make my position clear. I wouldn’t want to win on a Third Way neoliberal platform. Even if I thought it was the route to victory, I wouldn’t take it.” Incidentally, now that the majority of people are desperate for an alternative to the crushing weight of the status quo, class politics and socialist reforms are more popular than neoliberalism and are more likely to win. When presented with an alternative, working class voters will turn out! I ended part one of this series (which was originally going to be a two-parter) by posing questions which I have not yet answered: “What, then, is to be done? What can the left do now to beat National and marginalise the racist voice of Winston Peters in the next general election, in 2020? Was Metiria’s sacrifice for nothing?” After events changed and my thinking developed, I decided to expand this series to four parts. I shall try to answer these questions in parts three and four! What can the left do? For a start, put the term “neo liberal” into street cred language so that the average Jill Blogs can easily understand this particular political rhetoric; second, a genuine leftist party needs to be formed that represents the interests of the poor, the working class, Maori, immigrants i.e the disempowered and disengaged); third the new party will need to explain in easily understood language (eg through street theatre etc) their alternatives to the current capitalist system and how they will be implemented; fourth, realise that it will take a violent revolution similar to the French revolution of 1789 to truly overthrow capitalism and take the power and resources from the rich. They will only give up their power and riches through force and they will use the army, police and justice systems to maintain their power and control. There is one other possibilty that I see that doesnt involve violence and is already happening on a small scale and that is to participate in and develop community based alternative systems. For example alternative economies that bypass the banks, community gardens to share food, community groups that stand up to the Corporate greedies eg KASM . Withdrawing from the capitalist system (including politics) in large enough numbers and creating our own alternatives may hasten its collapse. Thanks for your second instalment. Your talk of “style over substance” politics seems particularly apposite now that noises are being made about Oprah Winfrey running for the US presidency. I will be interested to see your answers to the “what is to be done?” question in your future instalments – the movements behind Sanders in the US and Corbyn in the UK both look to have gained significant traction, and will become even more important if either manages to get their hands on the levers of power.